The Fortwo always has been – and always will be – the prototypical Smart car. While it has been far and away the brand's best seller, it's not the only model to to wear the moniker. A decade ago, Smart rolled out the larger Forfour, but like the brand's other models that have come and gone, it wasn't much of a success. Now, Smart is back and taking another stab at it with the introduction of this all-new Forfour. And this time, we think it's in a much better position to succeed. Where the previous model shared its underpinnings, production line and front-engined layout with the Mitsubishi Colt, the new Forfour was co-developed with – and will be produced alongside – the new Renault Twingo we drove recently. Like its predecessor (and its contemporary French cousin), the new Forfour is not presently earmarked to be offered in America. But curiosity got the better of us when we were offered the chance to drive it back to back with the Fortwo upon their launch in Barcelona. Like the smaller Fortwo, the new Forfour will be offered with a choice of two three-cylinder engines mounted all the way at the back: a normally aspirated 999cc engine (available in 59- or 70-horsepower states of tune) and a 898cc turbo kicking out 89 hp. Either engine can be mated to either a five-speed manual or six-speed dual-clutch transmission (save for the lowest spec, which can only be had with the manual). We sampled the top-spec model, fitted with the same turbo engine as the Fortwo we'll get in the States, sending 89 hp and 100 pound-feet of torque through the five-speed manual straight down to the rear wheels. The Forfour's (relatively) great mass means that, even with forced induction, it still takes 11.2 seconds to reach 62 miles per hour from a standstill. That's a 0.8 seconds behind the Fortwo with the same powertrain, but a solid 4.7 seconds quicker than the next (naturally aspirated) version down. It hardly felt rapid, but it kept pace just fine with European city traffic. Regardless of spec, however, the rear-engined layout it shares with the Fortwo and Twingo makes the new Smart Forfour exceptionally agile. That it felt any less scrappy than the Fortwo is a testament only to the latter's agility, because compared to anything else on the road, the new Forfour will change direction like a frightened street cat. Not only does it have a less pogo-ey ride than the Fiat Panda (one of its natural competitors), it'll turn around in just 29.4 feet, which makes it almost as nimble as the previous Fortwo's 28.7-foot turning circle. (Still not quite as tight as the Fortwo's 24-foot circle.) That's the kind of maneuverability that can, for a Smart driver, make the three-point-turn a thing of the past and parallel parking a cinch in even the tightest spots. 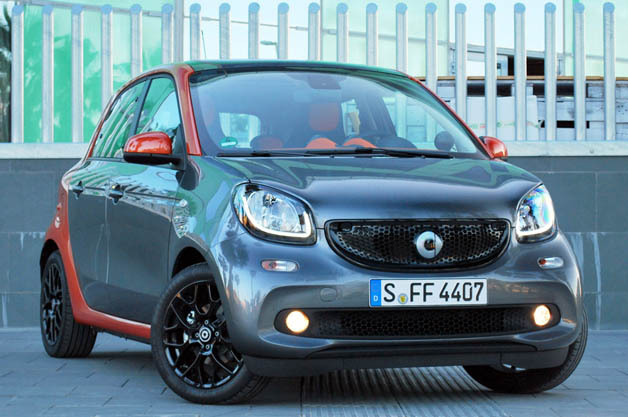 The new Smart Forfour will also physically fit into a smaller spot than just about anything available Stateside. At 137.4 inches long, it's not only shorter than any four- or five-door sold in America, it's more compact than most any two- or three-door hatchback, too. It's over two inches shorter (if you can believe it) than a Fiat 500, and nearly ten inches shorter than the old Forfour. In fact, the only thing you'll find in a US showroom with a smaller footprint (aside from the Fortwo) is the Scion iQ. Or a scooter. Despite the compact dimensions, Smart has managed to fit in four seats and four doors. The cabin is not what you might call "spacious," of course, but Daimler engineers have been at least as creative as their counterparts from Renault in maximizing the available space. Not only can the rear seat backs fold flat to create a level load surface capable of swallowing up more than 34 cubic feet of stuff, the rear seat bottoms (which conceal a cargo compartment in the Twingo) can also flip over to a lower position to fit taller items in the back seat of the Forfour. Even the front passenger seat folds forward to make for a 7.2-foot loading length for long items (or a napping space for a basketball player), and though the Forfour loses the Fortwo's split tailgate, the rear doors open nearly 90 degrees to facilitate access. Like other four-door city cars, those rear doors include only pop-out vents instead of roll-down windows, but the Forfour has other ways of letting in the light and fresh air: our tester was fitted with an optional double panoramic glass roof, and while the two-door cabrio is still in the works, the four-door can also be equipped with an electric folding fabric roof panel. Trim and features are otherwise just like the Fortwo – which is to say refreshing and full of personalization options – only with an extra pair of seats and doors in the back. The addition of those extra doors and the longer wheelbase they entail does not do the Forfour any favors in the styling department, though. Daimler's designers apparently tried to translate the Fortwo's rounded-box styling to the Forfour, but while it looks better than the previous duck-billed model of 2004, we're of the opinion that Renault did a better job at styling the Twingo than Smart did the Forfour. But that's a matter of personal preference. The question we're left with after driving any overseas model is whether or not it should be offered in the States. And with the Smart Forfour, we're just not sure one way or the other. On the one hand, the added usability could stand to attract some new buyers who might be enticed by the idea of frugal, no-more-than-what-you-need transportation – especially if offered as part of the Car2Go car-sharing program – but turned off by the notion of having little more than two seats and a glovebox at their disposal. On the other, the Forfour's pedestrian pace and questionable styling may turn others away and could potentially stretch out what the Smart brand has come to stand for in the minds of American consumers. Ultimately, we're sure Daimler will carefully evaluate the Forfour's prospects for the North American market. But at the end of the day, the Forfour still stands a much better chance of making its way to Smart dealers in the US than the Renault, whose American prospects essentially depend on Carlos Ghosn packing his suitcase full of Twingos and physically bringing them to Nissan showrooms.